Dame has two main meanings in go. In terms of basic capture, dame is an empty point or liberty adjacent to a stone or connected group of stones. Such empty points will have to be filled in to make the capture. See also liberty - introductory, dame is overloaded, and shortage of liberties (damezumari). An empty point (or area) between forces of the two sides, often of little or no interest to either side. The exact nuance differs depending on the context or game phase. A. In the endgame, empty points on the board which are not part of either player's territory and have no prospects of becoming territory. Normally, remaining neutral points are filled in at the end of the game by alternation between the players. In Japanese, this process is called dame wo tsumeru?. B. In the context of the opening, a region or area not interesting for either player. For instance, if Black has a strong position in the lower left and White a strong position in the lower right, the area in between is of low priority and thus dame. In this case, the suffix ba could be attached to dame, giving dameba, emphasizing that it is an area being discussed and contrasting the area's priority with those called oba (large points or areas) or kyuuba (urgent points or areas). C. In the middle game as well, an uninteresting point. 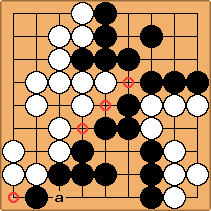 Often used in the context of "Black was forced to play on a dame point to connect his two one-eyed groups.". Dame wo hashiru. It also has the everyday Japanese meanings of bad, don't do it. They are common in discussing go moves. The Japanese rules define a dame as an open point that is not surrounded by live stones of only one color. When using territory scoring, the intersections on which neutral points are filled do not gain points, for either player. WikiMasterEdit by Andre Engels, original page can be found at /Before Master Edit. Relinked by DieterVerhofstadt, after the WikiMasterEdit of scoring. Further edited by Bob Myers. Bill: Not used in the everyday sense that often in talking about go, I think, because of possible confusion with the technical meanings.